It’s the most wonderful time of the year! 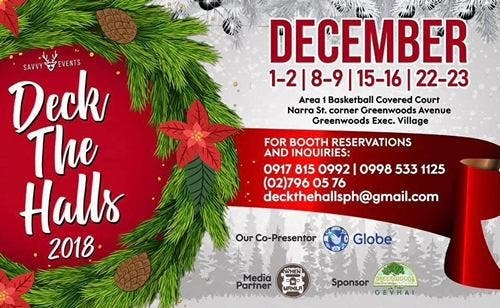 Christmas is just around the corner, and Savvy events, together with Globe Telecom, is here to give you Santa’s early Christmas present – it’s Deck The Halls Christmas Bazaar 2018. We invite kids and kids at heart to come and join us this December 1-2, 8-9, 15-16, and 22-23,2018 at Area 1 Basketball Court Narrast. Greenwoods Executive Village Pasig City. We’ll surely bring you a season full of jolly holly yuletide fun. We have a lot of gifts, surprises, and miracles to unwrap for you this Christmas season. One of the things to look forward to is a list of Christmas movies that we will be screening. We will have romantic, comedy, and family Christmas movies that we know everyone will enjoy. AKAI (Alay para sa may Kapansanan Association, Inc.) is going to sing us Christmas carols during the event, so we invite everyone to open their hearts and share your blessings to our brothers and sisters who are in need. There will be a raffle draw every day, care of our generous vendors. Savvy Events is all about sharing and giving and that is why we are here to create 3 Christmas miracles this year. We will be giving away 12 gifts of Christmas to our guests. The gifts will surely be a gift to remember. In certain days of the event we will create a night of winter wonderland; you’ll be able to experience snow here in Manila. And last but not the least, watch out for a 1 day visit from the “Big Man” himself. So you better watch out, you better not cry, you better not pout I’m telling you why, Santa’s coming to Deck the Halls Christmas Bazaar! This event will not be possible without the support from Globe Telecom, Greenwoods Executive Village Homeowners Association, and from our media partner WhenInManila.com. So you better make sure that you’re on the nice list when he comes! See you all! The BIG Red Sale at the Metrotent!